A funny thing happens when people start cooking healthful food for family and friends. They feel the need to announce that fact to everyone before serving it. “Ok, guys. Wait until you try this muffin! It’s made with flaxseeds and almond meal and it has no sugar! It’s unbelievable!” Of course everyone else is thinking it’s probably unbelievably bad and unbelievably tasteless. Or students will come to my class and go home very motivated (a good thing) to overhaul the pantry, the refrigerator and the family diet. And even though I urge them not to, they feel compelled to sit the family down and tell them how “things are going to change around here! There will be no more sugar! Or processed snacks! Suzy, spit out that gum. Don’t you know aspartame is the number one food-related complaint to the FDA?” Unfortunately, despite our well-meaning intentions, this strategy rarely elicits a positive response. On the other hand, I love being able to share recipes that are delicious, easy, and just so happen to be good for you. 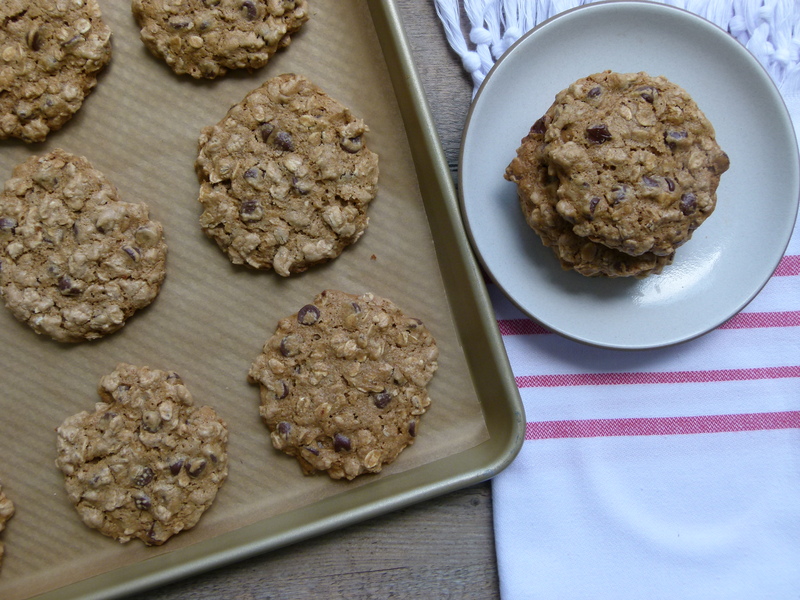 Take these chocolate chip oatmeal cookies, for example. Using a base of walnuts, maple syrup and a touch of coconut oil in place of butter and eggs, these are just darn tasty and not-so-shabby, nutritionally-speaking. 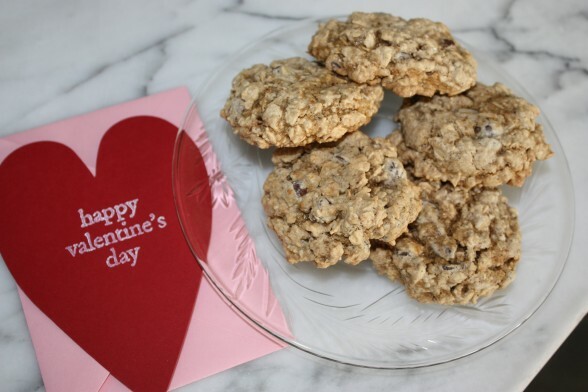 Valentine’s Day is right around the corner and if your school or office allows treats to be brought in, why not make a batch of these? Like many cookie recipes, you can make the dough several days in advance and keep it covered in the refrigerator. Take it out when you’re ready to bake and scoop it onto your cookie sheets. You can even freeze the cookies unbaked. Arrange them in a single layer on the baking sheet and place the pan in the freezer. Once the cookies are frozen solid, transfer them to an airtight container and keep them frozen until you’re ready to bake. Then just place them on a prepared baking sheet directly from the freezer and add another minute or two to the baking time. 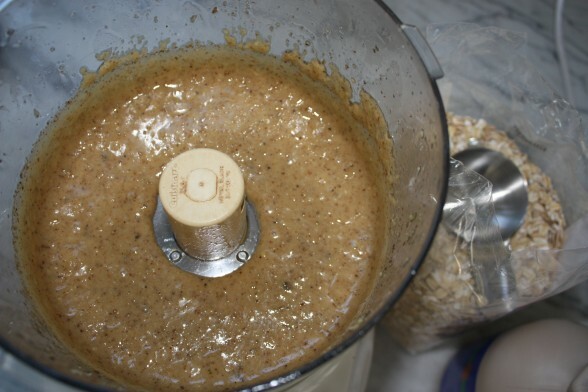 *If you need to make oat flour, place 1 ¾ cups rolled oats in a food processor and process until powdery. Place oat flour, baking soda, salt and cinnamon in a mixing bowl and whisk together. Place walnuts in a food processor and blend into a fine meal. Add oil, maple syrup and vanilla and process until mixture has the consistency of natural nut butter. Stir walnut mixture into flour mixture. 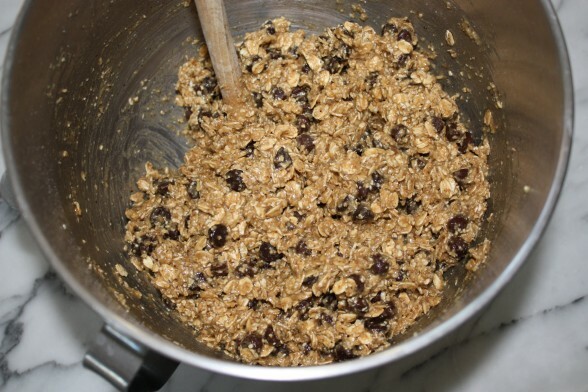 Fold in 2 cups rolled oats and chocolate chips. Use a 1 ¾ -inch ice cream scooper to form dough into balls, and place on baking sheets. You can fit 12 on a sheet. Flatten cookies slightly with a damp hand. Bake 13-15 minutes or until cookies begin to brown and tops look dry. Cool a few minutes and then transfer to wire rack to cool completely. The cookies taste good but mine came out too hard, is there any way to make them a little softer? Just cook them a little less. Your oven likely runs a little hotter than mine. You didn’t happen to bake on the convection setting, did you? Sure! Just reduce to whatever amount makes sense to you and you may need to adjust cook time to be a bit less. You’ll have to wing it on the cook time though. Take a peek 5 minutes early. Yay! I just made these twice this week for my vegan husband, but everyone loves them vegan or not! Hi:) I have steel cut oats in the pantry. Will that work if I blend them in the food processor? Or do they need be rolled? Thank you! Hi Maggie — I suppose you can try to make oat flour from steel cut oats, if that’s what you’re asking. But you can’t turn steel cut oats into flat rolled oats unless you steam and flatten them, which you can’t do! The rolled oats give a nice texture to the cookie, whereas steel cut would just be hard and too crunchy. I just tried these with a few substitutions – butter for coconut oil, honey for maple syrup (since that is all I had on hand). I made 1:1 substitution for both. But my batter was too wet. It looked nothing like in the pictures above. Even the final cookies were too gooey, sort of like half baked dough. I baked them for around 16 min and didn’t want to go any longer since the top on some of them was starting to burn a little. Any idea what went wrong? They did taste very good though. Loved these! I didn’t have walnuts so I used 1 cup of pecans and 1 cup of mixed almonds and cashews. Worked perfectly! For those who were asking for an oil-free version I also tried making them a second time and instead of coconut oil I used 1/4 cup of apple sauce. They worked well but I prefer the coconut oil version. Love hearing adaptations of recipes, so thank you, Rebecca! Your comment is helpful for people with a walnut allergy or if folks don’t have walnuts in the pantry. And yes, fat usually works much better in cookie recipes than applesauce for the crispy exterior factor. Thanks for sharing! Hi! I’ve heard great things about these cookies and can’t wait to make them. Do you have any suggestions for replacing the coconut oil? I try to stay away from oil when cooking but I’m not sure of a good substitute when baking. I think these would be so dry without the oil. Are you opposed to all fat? I think melted butter would work. Otherwise, maybe substituting almond butter….but I have no idea if that would work. Wow! Just wow! These cookies are CRAZY good! Like another commentor mentioned, I had come to the conclusion I was never going to have a good cookie again fter going vegan and trying what seems like a million recipes.. Not anymore! You are a cookie genius! Plus, the dough tastes amazing on it’s own. 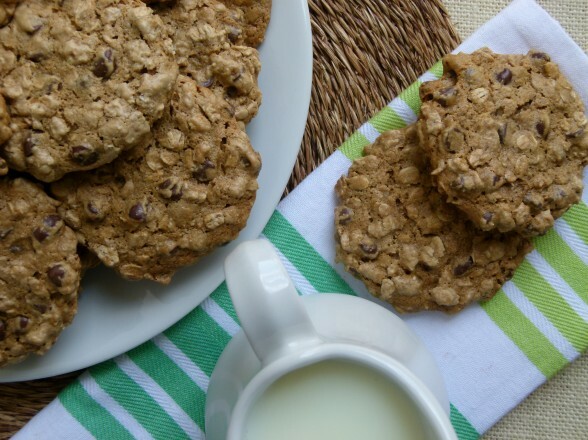 I am a sucker for oatmeal chocolate chip cookies and will most definitely be trying this recipe! They’re a favorite around here! Just made these tonight! So delicious! Thank you for helping me get my sweet fix with a little less guilt. Hubby likes them, too! I have actually refrigerated raw balls of these — raw cookie dough bites! These are my go-to allergy-friendly cookies. I use Enjoy Life chocolate chips and the cookies are so good. I keep a stash in my freezer at all times and they go with me to every potluck meal! Thank you!! And I love that I can eat the dough without worrying about getting sick! Haha! I make this dough to keep in the freezer for my teenage daughters and their friends to eat. They think they’re eating “cookie dough” and they have no idea it’s healthy! These are the best cookies I have ever had!! I am not even vegan- I love them my husband and all his friends can’t believe they don’t have refined sugar, eggs or butter!! Thank you for that, Chelsea. I’m not vegan either, but I agree — they’re so good regardless! These are stone hard, I have to dip them in the tea to soften….. I still have more dough in the fridge, can I “doctor’ it in some way to make them softer? Hmmm, sounds like they were baked too long. Perhaps your oven runs hotter than mine. Try timing them for less time in the oven and transfer them from the baking sheet to a cooling rack after they have sat for a minute or two. Hope that helps! Yes, I agree. I baked them again today only 10 min, they are delicious! Thank you! Perfect, so glad they turned out well! Hello – Can you make these without the walnuts or are they in there for a specific reason? Thanks! No, you can’t make this recipe without the walnuts since they provide binding and fat. You can substitute raw cashews and pecans if you want, though. Holy Sh-t! These are amazing! Finally a vegan, gluten-free Oatmeal Chocolate Chip cookie that actually tastes GREAT! You’ve made me so happy Pamela. I’d begun to give up hope of ever eating another delicious cookie in my life. I’ve tried so many recipes, so many GF flour combos to no avail. Excuse the above vulgar language but those were truly the first words out of my mouth upon biting into this delicious treat. God bless! Just making sure that these cookies are not supposed to have baking podwer in them since you mention ‘aluminum free’ baking soda. Thanks!! Thanks for catching that, Sally! No such thing as aluminum-free baking soda. But no baking powder in here. Thanks! Hello! I am just wondering if you think this could work with cashews in place of the walnuts? Hello! In the comments, I noticed someone used pecans and cashews instead of walnuts, so I think using all cashews should work. I tried the pumpkin version of this cookies with all pecans and it turned out great! Soooooo delicious!!! Thank you thank you. Have to give them away quick before I devour them all. Just wondering how these are vegan if they have the chocolate chips? You have to buy vegan chocolate chips! This look delicious… wondering what brand, kind of chocolate chips do you prefer.Sometimes I buy a chocolate Bar of 80% and crush it and add to cookies, but not sure the chocolate chips. I buy whatever is organic, usually Whole Foods brand. I made these and am in heaven!! So good! Do you happen to know the calorie or fat intake? I’m so glad you like them! Unfortunately, I don’t know the fat or calorie count, but there are so many sites with calorie counters where you can plug in the ingredients and get the info you need. It’s 192 calories per cookie (based on 30 cookies). This looks like a great recipe! I don’t really enjoy the flavor of maple, though. Is it a prominent flavor in the cookies once baked? Or is there a healthy alternative you’d suggest trying? Hi Cate, I don’t detect a maple flavor at all here, but your best bet is to use Grade A maple syrup (instead of Grade B) since that has a more subtle maple flavor. I have never tried another sweetener, but if you go for it, maybe go half honey and half Grade A maple syrup. These cookies are fantastic, you have to make them! SO GOOD!!! I went with the grade A maple syrup, light amber. It worked great, delicious without even a hint maple. I think I may need to get the walnuts and oats to a finer powder, but the cookies are amazing. Thanks for your response! Best. Chocolate. Chip. Cookies. Ever! I would never have thought of making a base with walnut butter. I try to sneak in walnuts whenever I can since they have omega-3’s in them so this is great. I think I will throw away all my other chocolate chip recipes and just stick with this one from now on. Thank you for creating these delicious treats! My son is allergic to nuts, can the walnuts be skipped? Hmmmm, unfortunately, the nuts are pretty critical to this recipe. They actually get pureed with the coconut oil and syrup and take the place of butter and eggs. Sorry! 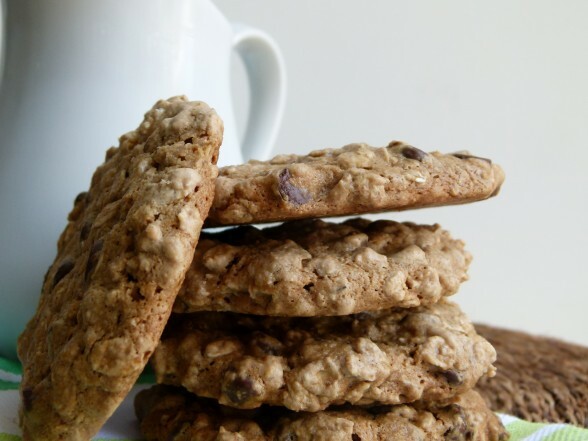 I made these with spelt flour instead of oat and 1 3/4 cups almond meal instead of walnuts with 1/2 cup dried cherries and 3/4 cups chocolate chips (half bittersweet, half semi sweet). They were delicious! Even my husband, who turned up his nose at them at first, ate three enthusiastically! I’m so grateful for your comment, Alex. I love knowing different ways to go with these recipes. Your version sounds amazing! This recipe sounds fantastic. I was wondering if you use oat flour with other recipes in place of all-purpose or whole wheat flour? I have never used/made oat flour, so I am curious. BEST COOKIES EVER! It’s almost like you knew I didn’t have oat flour. Thanks for the quick tip on how to make my own! Have you considered adding some videos to the article? I think it will really enhance everyones understanding. These are ridiculously delicious! I have had some very “non-healthy” friends make requests for batches of them and my family just flips over them! Terrific cookie recipe! Yummmm! They’re delicious, I agree! I have also halved the amount of chocolate chips and added dried cherries too — insane. ok never mind I just re read the recipe I have almond flour on the way so will wait till it comes in a few days that should work right? It looks like the comment from Andrea below shows she made them successfully with whole almonds instead of walnuts, but I’m not sure what the quantity would be with almond meal since I haven’t done it myself. Let me know if you give it a try! BEST COOKIES EVER. PERIOD. And I don’t just mean compared to other “healthy” recipes – these cookies can take on any cookie recipe on the planet and win. My kids are crazy for them and I’ve baked them for all sorts of people around town who are equally smitten. Thanks Pamela!! These might just be the best cookies I have ever made! I made them to bring to a friend as a hostess gift for a brunch tomorrow. I hope we have some left to give! Thanks, Rebecca — we all adore them here, too. Such a nice idea to bring them as a hostess gift! This is the go to recipe for cookies in our house. We have been making them with 3/4 cups of maple syrup instead of 1 cup. They are still delicious and sweet and I am happy because my kids are getting slightly less sugar! So good to hear that your kids find them sweet enough with less maple syrup. You’re obviously doing something right! These are SUPER delicious! Everyone who has tried them adores them. And for a dessert, not too shabby. I substituted almonds for walnuts, as I didn’t have walnuts. I used raw almonds with the skins on (no time for soaking), and they turned out delicious! People have asked me if almonds would work instead of walnuts and I have always assumed they would, but I have never tried it. Thanks so much for posting! Wow! I just made these, and I have to admit I was skeptical at first. But…they’re absolutely positively delicious! Just like the store in flavor and texture, but cheaper and better for you. I didn’t have maple syrup (it’s pricey on my grad student budget) so I cheated and used 1/2 a cup of sugar and 1/2 a cup of water, I also put in half the chocolate chips and used the mini sized and I added a handful of dried cranberries. It still turned out fabulously! I’m gluten free, and this is definitely being added to my list of favorite recipes. I’ll be trying the black bean recipe tomorrow! Thanks so much Pam! Hi Joy, Thanks for sharing how you adapted the recipe to suit you. I’m glad they turned out well! In fact, I think I might try mini-chips and dried cranberries next time — yum! these look delicious! can’t wait to surprise the kids with these! FYI we have made 4 batches of these in 2 days up here in mammoth. My son told me tonight this was the best cookie he has ever had. Please tell me your son didn’t eat all 4 batches himself! The. Best. Cookies. Made them for vegan friends and we all couldn’t believe how good they were! I said “were” because they’re all gone! Those cookies look so delicious. My family loves oatmeal chocolate chip cookies. We are going to make them together for a special Valentine’s Day treat! These are fantastic! I think you can eat them for breakfast with some cottage cheese. I make batches and then freeze them on a cookie sheet before baking. I put the frozen cookies in a container in the freezer and when we want a fresh cookie, we bake a few and eat them warm. Thank you for this and all the other amazing recipes. This truly is one of our favorite recipes in the world! Since Pamela has given us this, we make it all the time and everyone who eats them, loves them! They don’t last long in the Gilderman house. And my kids LOVE coming home to the smell of them baking after school. Thanks Pamela for creating a new family favorite!